We all know that some foods are healthier than others, but not everyone considers how specific foods can make us feel better from day to day. I know I have more energy when my menus include lots of fresh vegetables and whole grains, but I’m lucky to not specifically depend on any particular ingredients. For Chef Seamus Mullen, he’s found that eating certain foods has a positive effect on the inflammation he experiences that’s caused by rheumatoid arthritis. He explains, in his very down-to-earth approach, the benefits of filling his diet with those foods in his new book Seamus Mullen's Hero Food . But, the book isn’t a health-food, diet book at all. It’s a tour of eighteen ingredients that he’s come to appreciate, and they’re presented in dishes that fit into his style of cooking. I received a review copy from the publisher. The hero foods include things like olive oil, almonds, berries, good fish, mushrooms, and good meat. Many of the dishes are influenced by traditional Spanish cooking, since he lived and worked as a chef there and has operated Spanish restaurants in New York, and others are inspired by dishes served at his family’s Vermont farm. The food is seasonal, fresh, full of big flavors, and made with a few interesting techniques just like you’d expect from a chef. For instance, he includes instructions for making smoked olive oil which can then be used to impart smoky flavor to whatever is cooked in it. There are lists like “10 Things to do with Corn” and “10 Things to do with Almonds” that are above and beyond recipes. And, the recipes range from the decadent egg fried in olive oil and served with sweet potatoes and sobrassada to crispy grilled Tuscan kale. Moving from season to season through the sections in the book, Mullen repeatedly mentions the provenance of ingredients. He refers to “good eggs,” “good fish,” etc., and that means they’ve been well-raised, are sustainable, and are environmentally safe foods. Regarding good fish, choices like sardines, trout, salmon, and anchovies are both environmentally safe and high in omega-3s, and that’s why they are hero foods. As for choosing fruits, for him, it’s not enough that berries are good for you. He’s more interested in berries when they’re in season and picked at the height of ripeness. When fruits are picked fully ripe, they have a chance to develop more nutrient density than when picked early for distant shipping. Of course, these well-chosen, fresh ingredients also happen to taste better than others. In keeping with the theme of the book, I wanted to use some locally grown blueberries I had just received from my CSA. In the berries chapter, there’s a pretty stacked cake made with crepes, layered with sweetened yogurt, and topped with berries. It’s shown with raspberries, but any fresh berries would be great here. It has tangy flavor from buttermilk in the crepe batter, and the yogurt spread between stacked crepes was sweet from honey and spiced with freshly ground black pepper. You can taste as you add the pepper to decide how much you prefer, and it’s a surprisingly good match with berries. I know I’ll be flipping back through this book often for recipes like the Five-Minute Eggs with Romesco, the Salt-Baked Carrots and Beets, the Salbitxada sauce for grilled vegetables, the Pickled Plums, the Line-Caught Atlantic Cod with Picada, and the Autumn Squash Salad. I’ll be eating lots of healthy things with these dishes, and I know it will be great-tasting food. Recipe re-printed from Seamus Mullen's Hero Food by Seamus Mullen/Andrews McMeel Publishing. Most people think of crepes as breakfast food, but I prefer a savory breakfast. The tart yogurt filling and the buttermilk in the batter balance really well with the sweet raspberries (or blueberries). Mix together the flour, granulated sugar, and salt. In another bowl, whisk together the eggs, milk, buttermilk, 3 tablespoons of the clarified butter, and the zest of 1 lemon. Slowly add the dry ingredients to the wet ingredients and whisk into a nice, thin batter. If the batter seems too thick, add a bit more buttermilk. Heat a crepe pan or 10-inch nonstick skillet over medium-high heat. Brush the pan with butter. Add about 2 tablespoons batter, lift the pan and roll the batter around to create a thin, even layer. Once the crepe starts to form little holes, bubble a bit, and begins to turn golden brown, it’s ready to turn. With a spatula, carefully flip the crepe over and cook another 30 seconds. Remove the crêpe to a large plate and repeat until you’ve used all the batter, making about 10 crepes. In a small bowl mix together the remaining zest, yogurt, honey, and pepper. Place one crepe on a large plate, smear on a thin layer of yogurt, and top with another crepe. Repeat until you’ve layered all the crepes into a beautiful cake. Top with raspberries and confectioners’ sugar. This is one gorgeous breakfast! 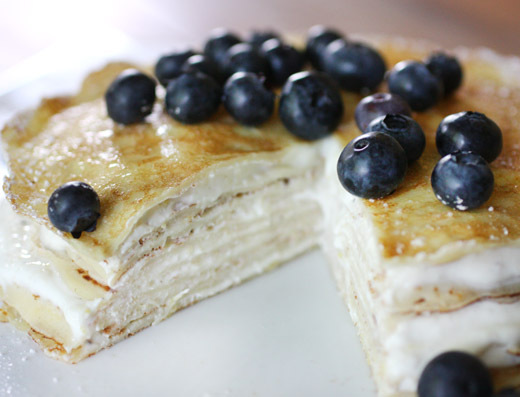 Or dinner :-) I've never thought to put yogurt between pancake or crepe layers. Sounds absolutely delicious! This sounds like such an awesome book and these look like pretty awesome crepes. So delicious! Your photos have me wishing I had a plate of them right now. Interesting book. Thanks for bringing it to my attention. And I love crepes in any form, so of course I love these! Blueberries = yogurt = happy mouth! We usually have crepes for dinner - they don't interest me for breakfast, for some reason. Anyway, thanks for this. Lisa ... You have been nominated for my NEW Food Stories Award for Excellence in Storytelling. Check out my site for the details (foodstoriesblog dot com). I'm always a bit concerned that books like this will be preachy but this sounds like it's anything but! The crepes look amazing. Almost like a mille feuille but for breakfast! Sophie Dahl has a recipe in her new book for stacked omelets, each a different color and flavor. It's next on my list to make. I want it for the dinner ;-) Looks super! This book belongs on my shelves! Seamus speaks "canary." 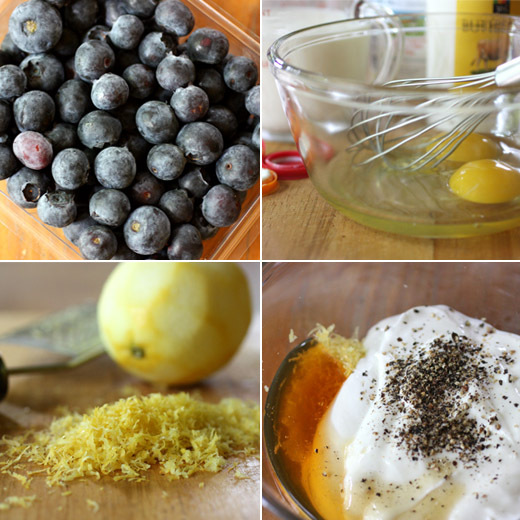 ;) Beautiful post and recipe, Lisa! oh my god this looks so delicious! 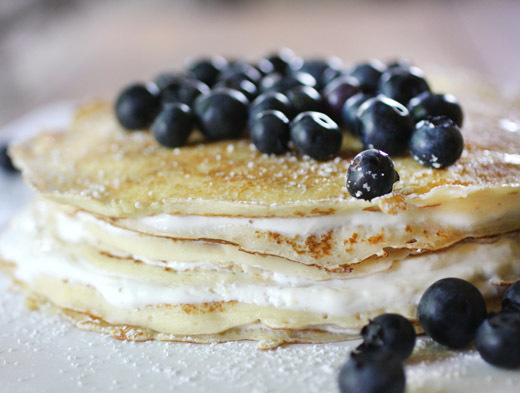 I love a nice stack of pancakes and these look like heaven! I absolutely need to try buttermilk crepes asap! I haven't tried buttermilk crepes before either as I've only recently seen buttermilk sold in Greece. Blueberries are cultivated in Northern Greece and never make it to the south. What a pity! crepes are always impressive to me, and crepe cakes even more so. one would be sacrificing nothing to have a slab of this for dessert! I sure do wish I had more time to read more cookbooks. That is on my bucket-list in the next few years and I move to homeschooling one child instead of two. I dream of sitting for hours, coffee by my side and just absorbing some of these fantastic cookbooks that bloggers highlight. Thank you Lisa. BTW, first orientation in Austin coming up for my daughter at U.T....I am so excited for her! Sounds look a good read. And the crepes look fantastic! Reminds me of one of my favorite summer tarts- fresh blueberries are layered over greek yogurt sweetened with honey in a graham cracker and crystalized ginger tart shell. Reminds me that I should make that tart again soon. I love savoury breakfast too! This is the perfect meal to start the day. Oh these pancakes look simply wonderful. I've just found your blog and it's gorgeous! I had to laugh when reading your profile - we share the same addiction! I'm so happy to sign up to follow you. As someone who is getting older and really needs to start paying more attention to what I eat - and the ingredients necessary to making my body work better and feel better, this book sounds like it is for me. And if all the recipes are as fabulous as this....I'm buying it. Wow these look great!